A few months ago I decided to try my hand at Elance again, since I had been doing this writing thing for a while. I have not let go of my other eggs, but I wanted to try something new, and to have more control over what I write about. I tried before but it seemed to be a big bust. This time has been much different. I think the main thing that made the difference is that I have experience, and I have samples. I can say in my bids that I have been writing for over two years, and I have various samples in my Elance portfolio as well as others I can send when appropriate. I have made some great contacts and found some great clients, and I think I have learned some things along the way that may help. While my experience is solely with Elance, I imagine much of what I have to share could be applied to other similar sites. With writing, there are plenty of places to get experience before you start bidding on jobs with a freelance site. With other types of work however, such as design, IT, and virtual assisting, this may be more difficult. Basically, I do not suggest using these sites as a starting point, but rather as a growing point. Get started, and then use something like this as a spring board. If you do start with little or no experience, the best way to gain experience is to be will to do stellar work for less than stellar pay. You will be able to charge more with time. Whatever kind of work you do, you need samples. Logos, articles, other types of writing, spreadsheets, whatever the case may be those looking to hire want to see that you can do what you say you can do. Make sure you showcase your best work. Be wise also, and black out names or numbers where appropriate. If you do a spreadsheet for someone, they would not appreciate you using that spreadsheet as an example of the work you can do with their name all over it. This is very important. You can get into all kinds of trouble if you do not pay attention to this one little detail. 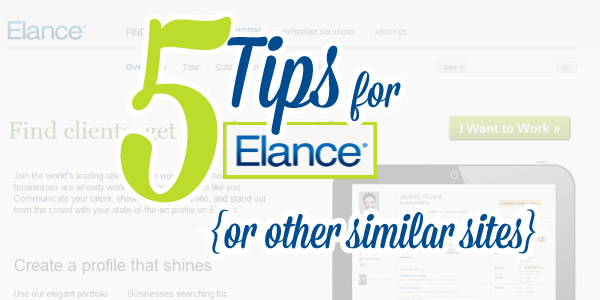 The great thing about these sites, including Elance, is that customers get to rate your work. This is only a great thing, however, if you do your best work and it is good. Therefore, be sure and give them what they want. On the flip side, do not place a bid on a job that you cannot do well. Be honest with yourself about whether or not you can deliver what they expect. Also remember, one instance of bad feedback is not the end of the world, it can be overcome, but it can be costly. Along the same lines, if your first few jobs offer great feedback, negative feedback further down the line is easier to overcome, so be extra cautious at the first. Basically, just do your best all of the time and you will get great feedback that could help you get more work. This is a tricky balancing act. You need to find a rate that you can live on, but that is competitive as well. Do not make the mistake of thinking that the lowest bid will always be chosen. In fact, I would venture to say that it is best to try to avoid those that only choose the low bidder, or that say low bidder will be chosen. Suit yourself, of course, but that is not what you are trying to accomplish if you already have experience. A good general rule for those with experience is to set a rate similar to or just above what you earn already as a starting point. For example, if you write for a content mill for a penny per word, maybe set your rate at 1.5 cents per word. If you do private design work already and you are looking for more work on Elance, use your regular rate. Do not under sell yourself. The best potential clients will see it either as a reflection of your work quality, or a reflection of your confidence in your work. By the same token, do not think as a new contractor you are going to charge top dollar and get a ton of work and become a millionaire. There is a balance. Elance offers a certain amount of bids free, and then you have to buy credits once that is exhausted each month. Many make quite a living using only the free credits each month. I have now chosen to invest $10 per month and have access to 30 bids. I think you get 10 for free. Use those credits wisely. I have found that if I bid on jobs I am especially skilled in, I have a much better shot. I have a business degree with a major in accounting, so I look for writing jobs in the finance niche. This one tip has been very profitable. I write on all kinds of topics, but the majority of bids that I win are for writing on some sort of business or finance topic. Take the time to write a personalized bid. Do not write canned bids. Read the posting, and try to put something personal in each bid. An example could be if the job asks for writing on a specific geographic location, and you have actually visited there or lived near there. It may not win you the bid, but is will definitely not hurt. Lastly, always check the job poster’s profile. You can get an idea of the kind of feedback they give, how many jobs they have awarded, and even read feedback left on them by those that have completed jobs for them. This can be very helpful. Be consistent. It will take time to find what works. Whatever you do, especially when first starting out, always, always have a back-up plan. Whatever kind of work you do, the freelancing world is feast or famine, and it is never wise to put all of your eggs in one basket. I really appreciate this blog post as I have been wanting to learn more about other bidding sites. My motto is to focus on one until I understand it completely and well, it is taking a bit longer than expected, but it can be confusing learning all the in’s & out’s of all these bidding sites! Good advice! I would also like to add that if you don’t have many samples to show potential clients, you can find places to write as a volunteer. I have seen freelancers use these “volunteer samples” in their portfolio. However, you will have to start at a much lower fee to gain the feedback. My experience with bidding sites has always been to work first for the feedback and then for the money! I like what you said about using it as a “spring board”. It certainly can lead to many good opportunities. Great advice yourself Leisa! I was so hoping others who had success with these sites would chime in. Everyone’s experience is different, and I agree, work first for the feedback…the feedback makes ALL the difference!